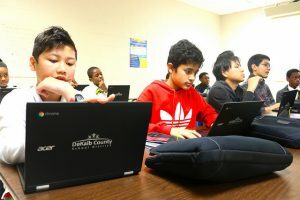 More than 100,000 DeKalb County School District (DCSD) students partnered on Feb. 23 to celebrate digital citizenship, positive behaviors and safe online practices. DCSD celebrated its second annual Cyber Safety Day, which featured performances encouraging safe internet use, lessons about cyber bullying, and discussions about how to properly use technology. At Freedom Middle School, media specialist Pamela Taylor asked classes what cyber safety is and what it means to their lives as students. “Cyber safety is not bullying other people on the internet,” answered one student. According to Taylor, through DCSD’s Digital Dreamers initiative, more than 1,200 students have access to technology at Freedom Middle School. She said the issue of cyber bullying has come to the forefront of many student discussions, primarily because students have new ways to stay in constant communication. Taylor encouraged students to confront bullying and report inappropriate behavior to teachers or parents. Freedom Middle assistant principal Sabrina McCombs stressed to students that the DCSD Student Code of Conduct applies to online behavior as well. “If you see someone in a group post inappropriate behavior – what should you do?” McCombs asked. “Tell an adult!” responded one class. 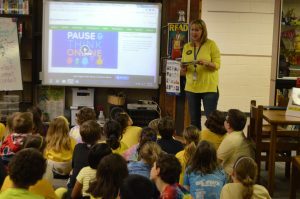 At Austin Elementary, students learned about their digital footprints and how posting things online may have more impact on the world than intended. Students dressed in various shades of neon yellow and orange to signify caution. 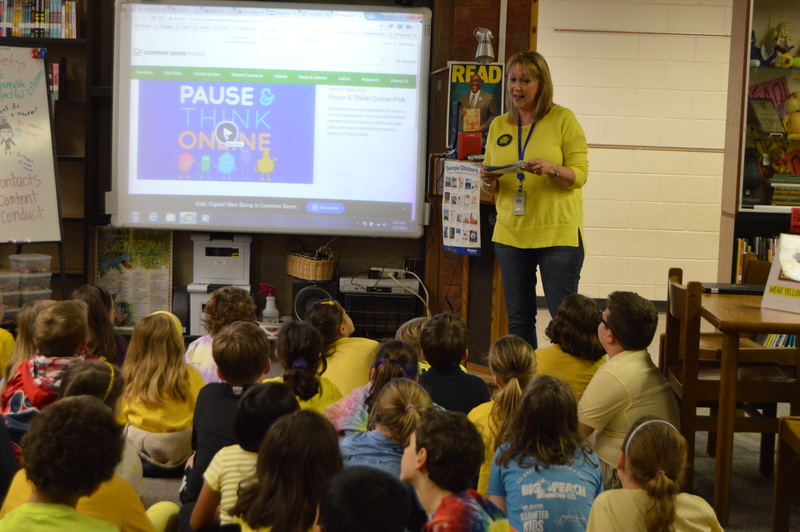 Austin teacher and media specialist Janie Kossak asked students questions about how they would prepare to visit the beach as a way to illustrate appropriate levels of caution. For example, students wouldn’t go to the beach without appropriate swimwear, sunscreen and weather monitoring flags. Kossak explained the same caution should apply to surfing the Internet. The students concluded their lesson with a song titled, “Pause and Think About It,” which encouraged deeper consideration before posting on social media sites such as Facebook, Twitter and Instagram. Students at Champion Theme Middle School took part in a lesson demonstrating how quickly rumors spread and how predators disguise themselves online. Social media has become a new medium for individuals to spread rumors, post unflattering pictures and degrade one another with anonymity. To help demonstrate this point, students began by sitting in a horseshoe shape. A teacher whispered a secret in a student’s ear, and told them to pass the message along to the next student and add something to it. By the time students finished, the message was indistinguishable from the original. Classes also discussed how people often misrepresent themselves online, often to disguise predatory behavior. To help illustrate this risk, students were handed envelopes describing a person’s life. While the outside of the envelopes showed teenage students, the envelope’s contents revealed them to be people with criminal records, elderly men and women, and worse. The lessons concluded with seven students singing and dancing to an original song celebrating Cyber Safety Day at DCSD. 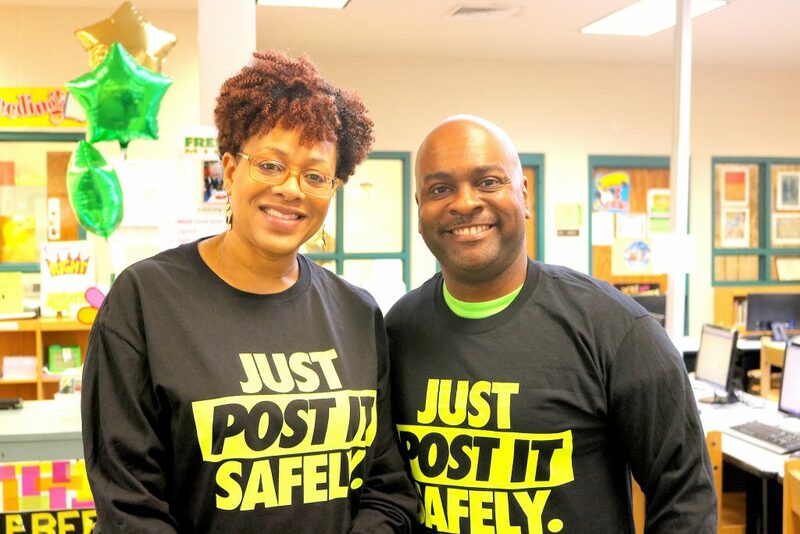 Cyber Safety Day ties into DCSD’s dial-up of districtwide safety and security. DCSD’s Instructional/Informational Technology division works diligently every day to provide web filters that curb harmful material and discourage negative behaviors. Throughout the remainder of the school year, stakeholders are encouraged to support the Cyber Safe DeKalb movement by posting photos of themselves engaged in cyber safety activities and using the #CyberSafeDeKalb hashtag. For more information, visit www.dekalbschoolsga.org/cyber-safety or follow the DCSD Twitter account at @DekalbSchools. Other DCSD communications, including PDS-TV24, will also be sharing stories on this districtwide effort.